Judging by the scuttlebutt, it would seem that not having a website is the same thing as not existing. Nietzsche would be proud – or he would feel nothing at all, I suppose. As a self-proclaimed expert in the field of psychotherapy technology, I get a lot of questions about how to dodge existential oblivion through building a Web presence. You certainly want your website to look professional and to have all the essential information that prospective clients need. However, don’t let perfectionism get in the way of launching your website, which is the hub of your Web presence. A website that conveys the kind of energy that you put out when you meet potential clients in person will go far in helping you not only get more clients but, more importantly, help clients that match well with you find you. Pictures of yourself, perhaps your space, and words that come from your heart are great ways to create a professional-yet-personal, attractive space on the Web. If a human being is not directly involved in helping you improve your search engine rankings, then all the automated search engine services in the world are well nigh useless. They definitely aren’t worth $60/month. Good-enough website self-hosting can be had for $10-$25/month. There are also excellent services that provide website hosting and maintenance, specifically for mental health pros, for a little more. We recommend you do not use TherapySites. TherapySites does not offer value for the cost. If you want services to help you improve your search engine rankings, you can do research on the best ways to do it (see below) or hire a service to help you directly. The Web is like a giant ocean of information. The beautiful part is that we can find any piece of information in that ocean if we look for it. The challenge is that no one will find the information we put out unless we tell them it’s there. As we’ll explore below, helping people find your website can mean several things. Maybe you’ll try to improve your search engine rankings so people find your site when they search for a therapist. Or maybe you’ll just try to make sure your colleagues know your website address, so they can give it to the prospective clients they refer to you. Therapist, Google thyself! Regularly. About every week or so. Or, instead, you can subscribe to Google Alerts and they’ll send you an email when something new about you pops up online. The stuff that shows up on Google when people search for your name is the stuff that potential and current clients will see when they search for you. Potential clients who’ve been referred to you will almost certainly try to look you up online. Knowing what they’re seeing when they look for you will help you know what needs to be improved about your Web presence. We all have heard by now that using social media – e.g. Facebook, Twitter, Pinterest, etc. – can be a good way to build up a professional and large Web presence and attract well-matched clients. The problem is that many people end up making accounts on these sites without having a plan for how to use them. Twitter, Facebook, et. al. don’t do much for you unless you have a plan for how to create your message, find followers, and get your message out to them. If you don’t have the time yet to make such a plan, wait until you do before creating an account. Otherwise your account will sit and collect virtual dust, which doesn’t look too great in your overall Google presence. One of the most magical ways to attract potential clients to your website it to get well-ranked in the local search listings of Google and other search engines. Go ahead over to Google and do a search for the words “counselor” + the name of your city. Go ahead. I’ll wait. If you scroll down a little bit you’ll see a block of search results that are paired with local addresses and a map. This is the Local Search section. Getting listed in the Local Search is very powerful. To be a candidate for getting listed there, you need to register and verify your office location with the search engines. Directories are sites like GoodTherapy.org or Psychology Today. There are also often directories that serve your local area. These directories don’t always bring in a lot of business, but sometimes they do. The success of directories depends on a lot of factors, such as how saturated your zip code is with other therapists. Don’t ignore them, however. Make sure you give them a strong chance to prove whether they work for you or not – perhaps give them at least 6 months. And remember that the more professional online presence you have, the better. If these sites only provide marginal returns in terms of new clients, do consider that they add to your overall professional online presence. 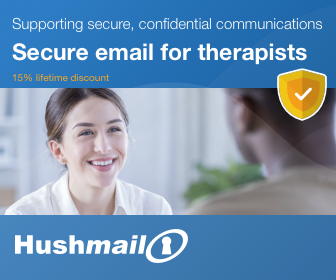 GoodTherapy also provides free online CE courses and other support for their members. It is a good site to support and to be a member of. Some therapists avoid the website thing altogether and just make a Psychology Today profile and leave it at that. This is a heckuva lot better than nothing. However, it’s also a heckuva lot less than actually making your own website. Directory profiles don’t provide much space for creating the energy that you want your prospective clients to experience when they see your Web presence. You want them to be able to read all about what you have to say and see what you have to show them. As Yoda told Luke, “Do or do not, there is no try.” SEO is, for many people, a full profession. You can certainly engage in it as a small hobby and garner the results of more clients in your office, but it’s something you’ll need to devote real time to. For the rest of us who aren’t into SEO, the best strategy for your website is to maintain it as an online professional brochure. Colleagues who refer to you, insurance companies who list you as on their panel, etc. can link to your site. Or if someone gets your name from a source they trust, the prospective client can do a Web search for your name and they will likely find your website. And that’s one of the most important things about online presence marketing. Unless you’re an SEO and social media wiz, you’re unlikely to get a whole slew of new clients just from building a Web presence. For most therapists, the Web presence is a much-needed adjunct to classic practice marketing: e.g. networking with colleagues, doing presentations in your community, and the like. For many of us, a strong Web presence is helpful to our marketing because it exists as an adjunct to marketing efforts in Real Life. Those with a knack for blogging may see a different story, but that’s not for everyone. The Web cannot be ignored, but it’s also not a silver bullet. Use it wisely and patiently, and it will help you get what you need from it. Thank you Roy! So many of these had my head spinning when I first opened the doors to my private practice. I wish I knew you then. I would have saved a lot of time and energy! Hi Roy! 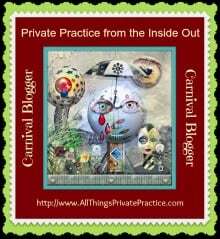 I’m so glad to be participating with you in this blog carnival! Thanks for these excellent points. I have also found that it is important to use a variety of methods to market my practice online and offline. I’ve actually been pleasantly surprised by how many calls I get from directory listings such as PsychologyToday. That said, I find my relationships with colleagues (therapists and other helping professionals) to be invaluable — not only for the referrals, but for the community and collaboration that they offer. Yes, indeed, Jeremy. And that community is also a great way to build our web presences. All our cross-talk and mutual involvement shows up when people look us up online, and our professional personalities show through in it. It’s good stuff! This is such helpful information! I think in general people feel a lot of pressure to be online as therapists but they do not have guidance. You give a clear sense of how to determine what the right steps are to building an online presence and you rightfully highlight being active and having a plan. Just putting up a website or signing up for therapist directories is not going to cut it! Indeed. Thanks for backing me up, Vanessa! Roy, as usual you provide incredibly helpful information! Especially for those of us who are…shall we say…less than tech savvy! Thank you!!! I really enjoyed reading your post. “If you build it, they will come” made me laugh. :) I think that so many therapists struggle with just making/putting up their website and/or online directories that follow-up is difficult to do. Thanks for your link to free SEO info – I’m definitely going to check that out! Yes, it really can be a struggle. You just have to decide how much time you want/need to invest and how much return you want/need from the website. You can make a very simply and minimally useful website quickly and easily with tools like Wix or Weebly, or by making a Psychology Today profile. But the return on the effort really is quite minimal. Top article Roy! I love that you covered a lot of different online marketing activities, as I believe the best strategy for success online is to have a broad and diversified online profile to get the best results. As you mention, focusing on only one activity will bring you limited results. Personally, my website and blogging has been one of the most effective marketing activities that has grown my list as well as increased my organic search results in Google. I think whatever you do, if you’re providing real value to the people that follow you online, you just can’t go wrong. Thank you for this Roy! Our one hour phone call (last month?) has spun into all sorts of good results in terms of helping me develop my private practice, so thank you for that as well as all this good information you put out there. I have a website/Facebook question, which perhaps you address elsewhere. My website links to a business Facebook page I created (and vice versa). I haven’t done any paid marketing through Facebook, but they are of course always offering it — “boost your post locally” kind of thing. I’ve been afraid to try any of that because it’s completely foreign territory to me. Do you have thoughts about this Facebook marketing stuff? I recently went to the website of an MD while searching for a PCP for myself and after that one website visit, her face started to show up everywhere — on my personal Facebook page, on advertizing inside of the solitaire app I was playing. It was a little creepy — this is just a small medical private practice. So it made me wonder if paying for Facebook advertizing would result in the same kind of weird stuff — my face showing up randomly in people’s lives online, and whether that is perhaps a bad idea? Would love any thoughts you have about this. There are a lot of valid criticisms of the Facebook advertising scheme. I would only use it if you really know how to use it effectively. Great article – love to see all these tips in 1 place! What do you think of GoDaddy.com? Also, the 1st site you list in the website builders section, WP Engine, is $250.00 a month. Athena: GoDaddy is poorly liked or trusted in the tech community. However, they may or may not be suitable for your needs. You can expect occasional problems and poor support, but the low cost may be worth it. Most therapists don’t have high needs for website hosting. Be aware that WPEngine doesn’t provide email services. If you go with WPEngine, you’ll need to also get something like Google Apps for Work (~$5/mo) or MS Live 365 (~$5/mo) to handle your email services. Both of those services will also provide a Business Associate Agrement to health care customers, however, so that course may be preferred by most therapists, anyways. Thank you for your quick response. I think I am struggling with this unnecessarily but I want to promote more customers to my clinical supervision practice than my therapy practice. I am thinking I need two websites with two domain names. I see that your class on website development is not running at this time but do you do consultation on this topic? what is your cost for this? Hi Roy: I just completed the Zur Institute certificate course in telemental health. I’m a clinical psychologist in California and plan to do an online only practice. I’ve been looking into Brighter Vision and EmpathySites. (I don’t yet have a website.) I’m looking into stock photos, but I want something that imparts connection between me and those I work with. I absolutely love the illustration of the yogi doing, I assume, online therapy on your site. Did you find that somewhere, or commission someone to draw it for you? Would you mind referring me to where you got that? Of course, I don’t plan to use the same illustration, but something like it using a laptop. Hi Suzanne. We’re glad you like it! It was commissioned many years ago through an online service called fiverr — https://www.fiverr.com/ We got extremely lucky with it turning out so well. Sorry, would you mind removing my last name in the comment I just sent. I didn’t understand it would be posted. I’m one of the older people not as familiar with tech!